First-person shooters make me sick. I don't mean that I'm disgusted by them. I mean that games with a first-person perspective actually make me physically ill. I first realized I had a problem years ago, when my coworkers were taking a "Quake break" and wanted me to join. I watched the screen for a bit, got a headache and went back to work, dismissing first-person games as something that "wasn't my thing." Then I played Star Wars Galaxies, my first true departure from the safe, comfortable isometric world of Ultima Online. It, too, made me sick at first, but my desire to play with my friends somewhat offset the symptoms. I thought getting sick was a fluke due to stress and general insomnia, so I kept playing until I had largely acclimated to the sensation. When World of Warcraft came out, however, my patience finally broke. I wanted to know what could be done about my symptoms, and this led me into a well-documented field of research. Finally, it had a name: simulator sickness. Virtual Simulator Sickness (VSS) is a type of motion sickness and a well-documented effect of simulator exposure. The symptoms are practically identical to typical motion sickness: nausea, vomiting, confusion and general discomfort. 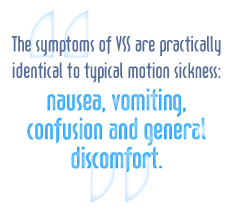 But unlike traditional motion sickness, VSS does not require any physical movement. It comes out of nowhere and can happen to anyone, much to the chagrin of lifelong gamers. It's also a lot more common than most people think: One study conducted by the U.S. military claims 20 to 40 percent of tested pilots suffer from this malady. With a large variety of simulators for different purposes available to the general public, the problem is likely more widespread than those estimates suggest. Researchers still disagree on the exact cause of VSS. The most common explanation is the "cue conflict" theory. Cue conflict occurs when input from different senses are in conflict, resulting in an inconsistent perception of movement. Other scientists claim that the "cue" theory lacks the ability to reliably predict which situations will invoke a mismatch of cues - or the severity of the results. Most literature and research, however, relies on the cue conflict theory because it has enjoyed large exposure to the public and is the best fit for much of the available data on the topic. For gamers, VSS can be quite a nuisance. In a fight that is dependent upon any sort of 3-D movement, VSS can slow your reaction time and make it harder to move to a safe spot. It can be frustrating and occasionally disastrous in a group setting, but you can overcome it with enough patience (both on your part and from your teammates).